Olive oil is one of the key ingredients of Cretan diet, which is widely acclaimed as a healthy and balanced diet, contributing to the reduction and prevention of chronic diseases. 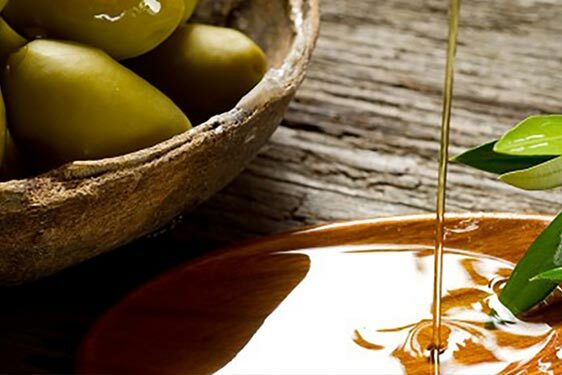 Olive oil and edible olives have always been the foundation of the Cretan diet, they constitute a necessary ingredient in almost every recipe and are always found on the Cretan table. Extra virgin olive oil with a greenish-yellow color, fruity and pleasant bittersweet flavor, which decreases over time. It is produced from the olive varieties «Koroneiki» and «Tsounati» in the regional unit of Chania. The extra virgin olive oil «P.D.O. Viannos Heraklion Crete» has a distinctive thin and fluid texture, a greenish-yellow color, the taste of mature olive fruit and a special aroma. It is produced from the «Koroneiki» olive variety, within the administrative boundaries of the former province of Viannos, in the southeastern part of Heraklion regional unit. The cultivation and processing of the olive fruit (in certified olive presses) takes place exclusively within the administrative boundaries of the former province of Viannos. Extra virgin olive oil «P.D.O. Northern Mylopotamos of Rethymnon Crete» is distinguished by its yellow-golden color and its fruity aftertaste. It is produced in the regional unit of Rethymnon, within the geographical boundaries of the former province of Mylopotamos. The olive fruit used for its production belongs to the «Koroneiki» variety (at least 90%) and the remaining percentage belongs to the «Chondrolia» variety. Extra virgin olive oil produced from the Koroneiki olive variety. The cultivation and production of the olive oil takes place in the wider area of Peza in Heraklion regional unit. The extra virgin olive oil «P.D.O. Peza Heraklion Crete» has organoleptic characteristics of mature olive fruit and is distinguished by its unique aroma and flavor. The extra virgin olive oil «P.D.O. Archanes Heraklion Crete» belongs to the «Koroneiki» olive variety and is produced in the wider region of Archanes (Heraklion). It is an exquisite olive oil with a greenish-yellow color, distinct aroma and fruity flavor. The olive oil «P.D.O. Kolymvari Chania Crete» is characterized by moderate fluidity, its greenish-yellow color, mature olive aroma and fruity, bitterish taste that decreases over time. It is produced by the «Koroneiki» variety at a percentage of 90%. The olive oil «P.D.O. Sitia Lassithi Crete» is exclusively produced from the «Koroneiki» olive variety. It has a greenish-yellow color and is distinguished for its particular organoleptic characteristics. It is one of the most famous types of olive oil in the world and has been awarded 3 times with the First World Prize. The olive oil «P.D.O. Apokoronas Chania, Crete», is an extra virgin olive oil made in the homonym region. At least 90% of its content comes from the «Koroneiki» olive variety. It is distinguished by moderate fluidity, clear golden-green color, pleasant taste and fruity aroma. The quality characteristics of this extra virgin olive oil are directly connected to the «Koroneiki» olive variety cultivated in Thrapsano, as well as to the unique climate and soil composition in the area. It has a light texture, light green color, bittersweet taste and an intense fruity aroma, which is preserved for a long time. The «P.D.O. extra virgin olive oil Selino, Crete» is produced from the «Tsounati» olive variety (at least 60%) mixed with the «Koroneiki» variety (up to 40%). It is distinguished by its dark-green color, fruity aroma and slightly bitter and spicy flavor. The specific characteristics of this olive oil are due to the unique climate and geomorphology of the former Selino province in southwestern Chania. Produced in the wider area of Messara of Heraklion regional unit, this P.D.O. extra virgin olive oil is extracted from the «Koroneiki» variety. Its color is shiny green but becomes greenish-yellow when mature. It has a strong fruity aroma, a mild and balanced flavor, characterized by a bitterish aftertaste. Olive oil has antioxidant properties that, through systematic consumption, offer unrivaled benefits to human health. Research has shown that olive oil consumption can reduce LDL cholesterol and blood pressure, thus shielding heart function. Its high content in monounsaturated fatty acids, vitamin E and polyphenols, have a beneficial effect on the human body, reducing the risk of cardiovascular disease and protecting against various forms of cancer. All P.D.O., P.G.I. and organic olive oil brands produced in the Region of Crete is of exceptional quality, extracted straight from the olive fruit, without any further processing. Cretan olive oil is characterized by extremely low acidity and unique organoleptic characteristics, making it eligible for the classification extra virgin olive oil according to the quality characteristics set by the International Olive Council and the European Union. Today in Crete, 11 types of olive oil have been recognized as P.D.O. or P.G.I., while the table olive “Throumba Abadias” of Rethymnon has also been distinguished as a P.D.O. product.